“Punked-up three-chord rock ‘n’ roll and ‘50s doo-wop harmonies.” – Kerrang! Los Angeles punk quartet The Regrettes have shared a video for their single ‘Come Through’ (Impact date May 25th) as their most extensive UK tour to date approaches in May. The lead track from the band’s current ‘Attention Seeker’ EP, the track’s colourful video was directed by Claire Marie Vogel and created by an all-female-led crew. The EP represents their first release since their 2017 debut album ‘Feel Your Feelings, Fool!’. 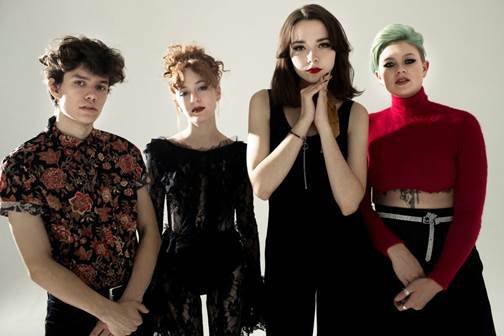 The Regrettes are fronted by 17-year-old Lydia Night (vocals, guitar) and completed by Genessa Gariano (age 20, guitar), Sage Chavis (age 20, bass) and Maxx Morando (age 19, drums), who have collectively dominated the Los Angeles music scene with their infectious – and unapologetically honest – punk-driven pop songs. Together, they have garnered widespread critical acclaim from the likes of Kerrang!, NPR, Vogue, Entertainment Weekly, Billboard, Stereogum, Consequence of Sound and more. The Regrettes have also toured extensively since forming in 2015, including a set at Riot Fest in Chicago as well as shows with Sleigh Bells, Peaches, Cherry Glazerr, The Frights and most recently, SWMRS. The Regrettes are set to play a UK headline tour in May which includes a London show at The Old Blue Last and the Dot To Dot Festival. They’ll then return in August for the Reading and Leeds Festivals. Their forthcoming U.S. dates include headline shows and gigs with Cold War Kids as well as festival appearances at Coachella, Governors Ball, Bonnaroo, Firefly Music Festival, Treefort Music Fest and more.